Having had the opportunity to hear Ken Ham speak at a conference, I came away feeling that he is not only well-educated on the Bible, but he also has a passion for sharing the truth of God's Word. These characteristics bring credibility to The New Answers Book 4, which carefully deals with challenging and sometimes controversial issues. What I like best is how well researched the book is, and everything is backed by evidence with numerous footnotes on each page. 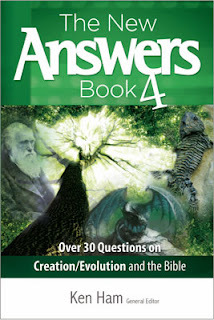 The New Answers Book 4 is formatted in chapters, but it reads like an encyclopedia. Many charts, graphics, and photographs are included to further back up the points made in the answers. The chapter, "What are Some of the Best Evidences in Science of a Young Creation?" goes into scientific and historical detail about the sedimentary and rock layers, soft tissue found in fossils, which are illustrated with detailed graphics and photographic evidence. The only "con" I find with this book is that the pictures are not in color. We have other Answers books in our collection, and I find them to be valuable resources in our homeschool. I pull this book out frequently during our history and science lessons to use as both a text and reference book. When my kids have questions about discrepancies in scientific beliefs, we can consult these books for many answers, or at least find a starting point for our own research. The New Answers Book 4 is geared toward an adult audience, but my high schooler middle schooler find it easy to navigate. For younger children, I recommend The Answers Books for Kids. Read a preview here. Learn what other bloggers think about this book here.